Herdabout K-9 Academy ... Our Brags & Results ... Dogs Doing Well ! This is just a couple of examples of people who trained their dogs at Herdabout K-9 Academy. Also a few special mentions of dogs from Herdabout Shelties who are achieving titles with their owners. Please check out our Schedule of Upcoming Classes and consider joining in on the fun and excitement. Your dog will thank you for it ! 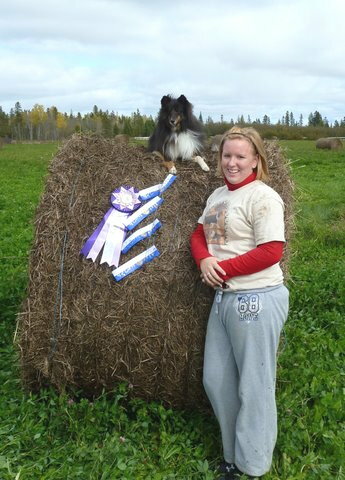 Crystal and Jovi made the Top Dogs in Canada 2010 List in both AAC & PDSC. They also qualified for the AAC Nationals 2011. Crystal and Jovi live in Kingston and train with Dawn Chisholm at Morning Star Dog Academy. Congratulations on all your achievements ! We bet there are more to come !!! Dawn Chisholm and Xena also earned their way to the AAC Nationals for 2011. Dawn is the owner of Morning Star Dog Academy in Kingston Ontario. Handled by an amazing young lady named Rebecca, who started with us at just 13 years of age. This young team has wowed the crowds at many an agility trial with the speed and accuracy this little dog has, along with Rebecca's great handling skills. Rebecca is a talented handler and is a joy to train. This successful duo has trained exclusively with us here at Herdabout K-9 Academy and we are really proud of them. Lots of lovely placement rosettes and new title rosettes !! > Trimand Jeff complete their RAE title (10 double Q's in Advanced & Excellent) with multiple placements in the top four scores!!!! (94, 96 & 97) as well as two extra Q's: another second place score (91) and one third place score! 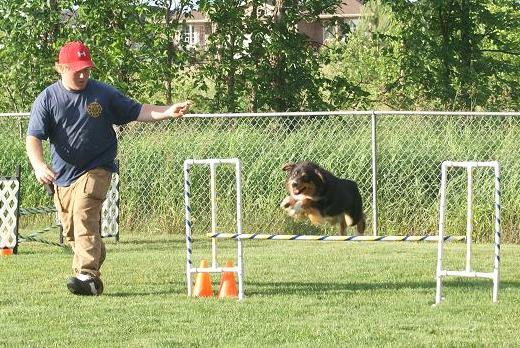 > Robert and his 11 month old australian shepherdTaz earn their RN title with a second place and a third place score! ONE WEEKEND: NINE NEW AGILITY TITLES !!! 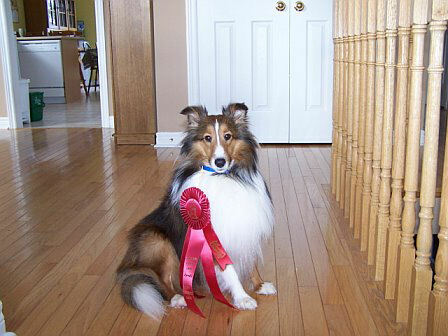 > Sherri with her two collies Sugar & Brodie earned THREE agility titles in one weekend! A new record has been set ! 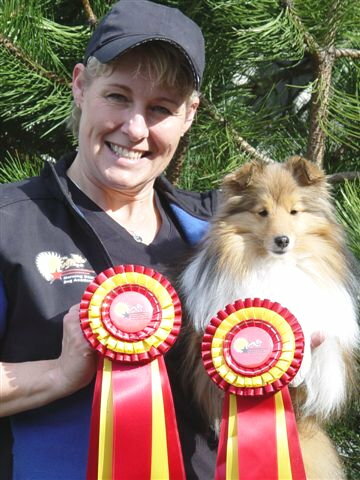 > Lorraine and her 9 & 1/2 year old sheltie COLBY earned their AGIJS title. 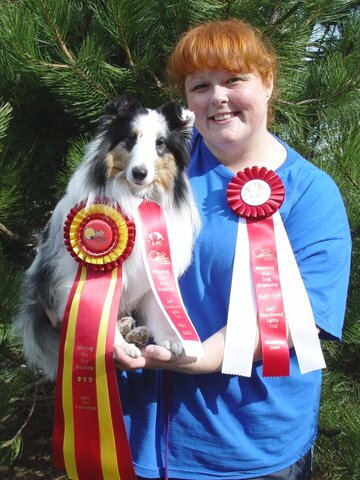 > Jessica and her Australian Shepherd Uno earned their AGIJS title. > Anne and Nessa earned TWO novice titles (walking into the ring with no Qs) and walking away from the weekend with their AGNS and AGNJS titles. > Kellie and Dash earned their AGNJS title. > Jeff and Trim earn more legs to their AGXJ 1 title: only 6 more Qs to go! Super genius indeed! 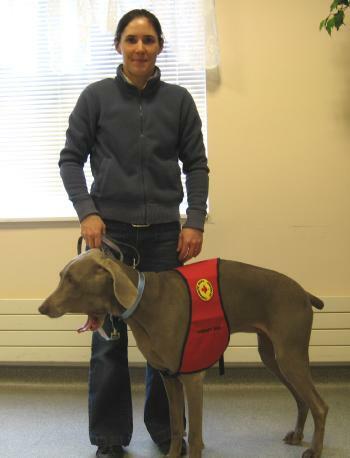 Probably the smartest Weimeraner in our area, this young dog was handled by Rhonda Stickle to some great accomplishments. It is a joy to watch the attention and focus that Wiley gives to her owner Rhonda. Wiley has an exceptional response to hand signals and often impresses her onlookers at trials. Watch out for Wiley and Rhonda in a ring near you! Owned and Handled by Jessica Schacherl. 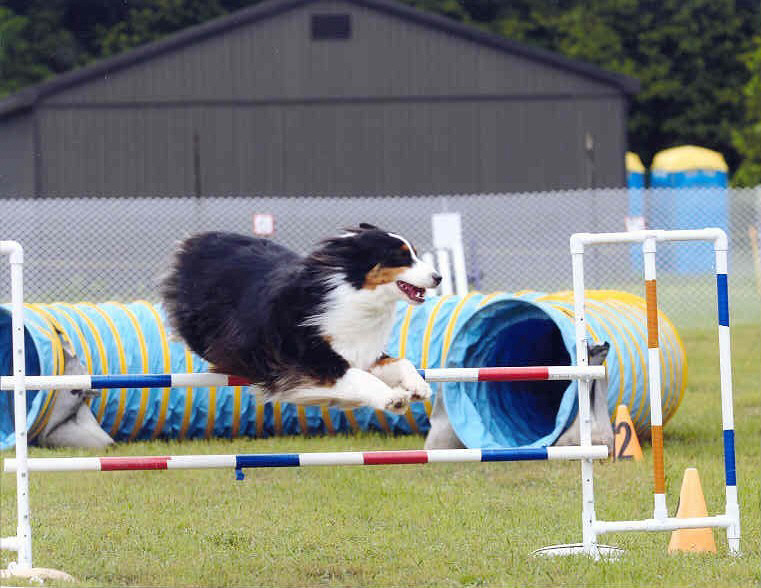 This tri coloured Australian Shepherd received three qualifying rounds and her AGNJ title her very first agility trial ever, on her first weekend out competing at dog shows. While Eve has a very stubborn and independant streak to her personality, Jessica did a wonderful job training and handling this dog to win all four perfomance titles in just a few shows over the course of only two months of competition. Jessica also showed Eve to win 9 of the 10 points needed to be a CKC Conformation Champion, including a few Best Of Breed wins – all owner/handler groomed and shown. This young blue merle Australian Shepherd was trained and handled by Jessica Schacherl to receive his CGN and RN titles as a Jr. Puppy. Puzzle also competed in formal obedience and received one leg towards his PCD title. Groomed and shown by his owner, Puzzle also finished and received his CKC Canadian Championship as a Sr. Puppy. Watch out for this handsome boy in the Obedience and Agility rings this summer, as more titles are imminent and expected. 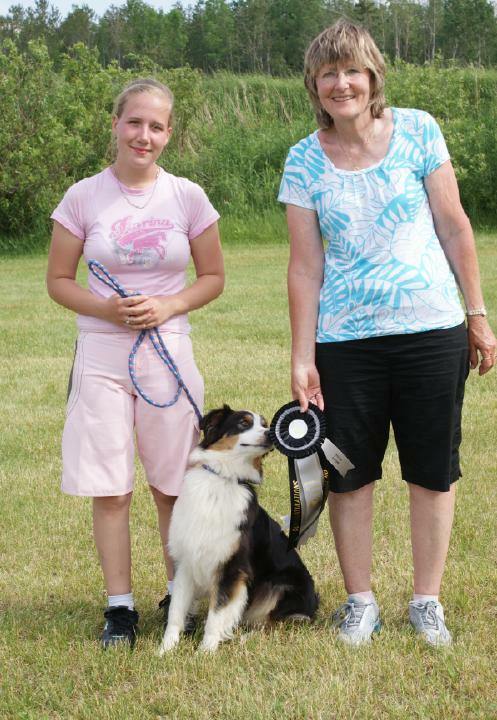 Robert Hall did a great job handling this very happy tri coloured Australian Shepherd to all four performance titles. These titles were also earned over a very short two month time frame, with very limited showing. During the Rally Obedience trials in Kingston, the judge remarked to Robert that he was the most patient handler she had seen in a long time. Robert and Uno received ribbon and scoring placments in the top four at their first ever Rally competitions. Congrats to Robert and Uno ! Owned and handled by Shirley Beere, this young spitfire showed real potential for agility while attending our Jr. Puppy Kindergarten class. Shirley has done an excellent job training this very social little Shih Tzu and has earned her Starters title in AAC agility. 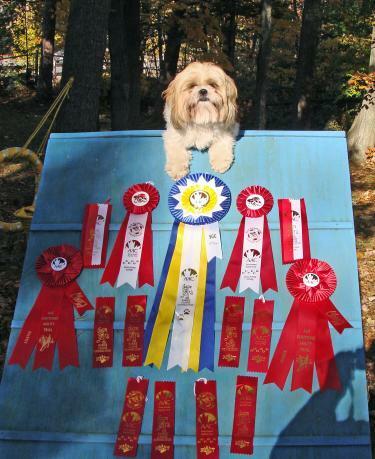 This is further evidence that Shih Tzus are not merely a lap dog, but can also have great drive and athletic ability....although the occasional visitation of a ring steward may be necessary during an agility run, but that's just to prove how well socialized they are. Way to go Shirley and Ginger! Handled by Carl Jourdey, shows off her second place ribbon won at the Pre-Novice Level 1 graduation competition. Syrie also took second highest score (over all) for combined scoring of all graduating classes for the day. 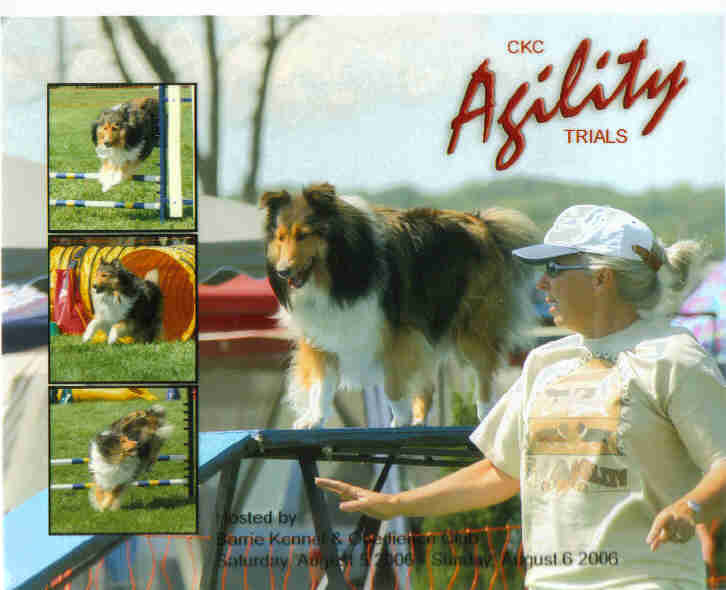 received the two CKC agility titles after a mere six months of training. 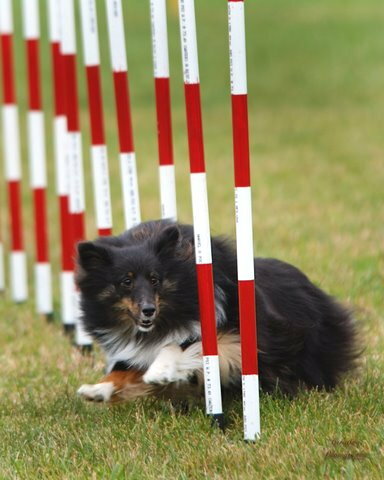 Nessa also has a few qualifying rounds towards her intermediate agility titles and will be back out to finish those next summer. 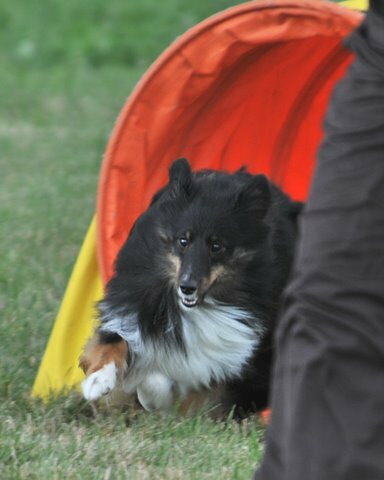 Ceilidh was Adrienne's first agility dog. This very happy team were able to achieve both their AGNS & AGNJS titles in their first three weekends of trials during their first summer of competition. Their plan was to achieve a higher level of agility titles each year, a steady approach to competition. By the end of their third summer in 2008 Ceilidh had achieved both her excellent level titles. In 2009 this duo planned on working towards their Master Excellent title. 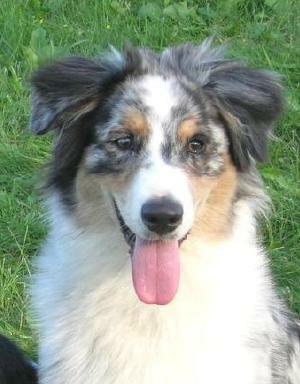 Sadly this was not to be, as Ceilidh's life came to a sudden and unexpected end in March 2009. Congratulations to Adrienne on her accomplishments with this very happy little sheltie...we will all miss her very much. Owned and loved by Eric & Sarah, trained and handled by Adrienne. 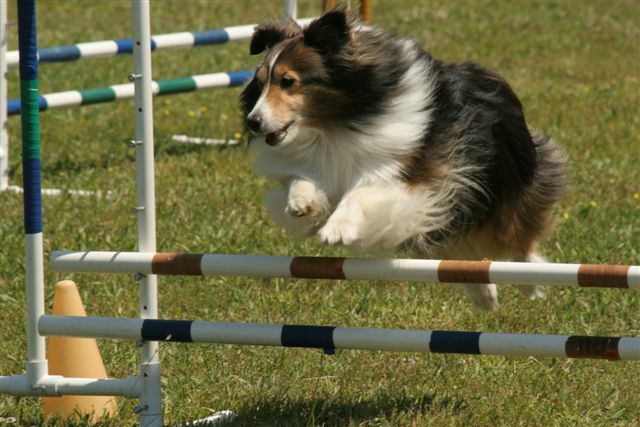 At just 13 & 3/4 inches tall, Seamus is a very fast little sheltie that just loves agility. He also has a sweet and bubbly personality showing great potential for a therapy dog. Just barely old enough to compete, Seamus earned his Agility Novice title his first weekend out competing at his first agility trials. We look forward to seeing more titles on this cuddly young dog in 2009. Lorraine Sanford and her talented Colby - Kincardine Cassiopeia - win first place in their agility class at their first trial despite the frightful weather. Colby, who is closing in on 9 years old, certainly doesn't look her age in this action shot . Colby has the ability to work away from her handler at great distances and just rips up the turf! Congratulations Lorraine -you've done a beautiful job training this lovely lady. 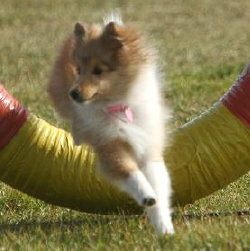 A full sister to our Herdabout The Whole Shebang CGN RN (Shebang), Scandal is an amazing little sheltie that will be burning up the agility rings in July of 2009 as she will finally turn 18 months of age and be old enough to start competing in agility. Her handler and trainer, 13 year old Rebecca, has done an amazing job with the potential "superstar", having earned her Canine Good Neighbour and her Rally Novice title at just 7 months of age. The focus, drive, intensity and loyalty of this young dog is astounding to watch. Keep up the good work Rebecca ! Congratulations goes out to Clyde and Kate, who got their first qualifying round in Starter Standard at their very first agility trial ever ! The happy team are now on their way to their first AAC agility title. More Brags & Results coming soon ! Bookmark this page and check back regularly.